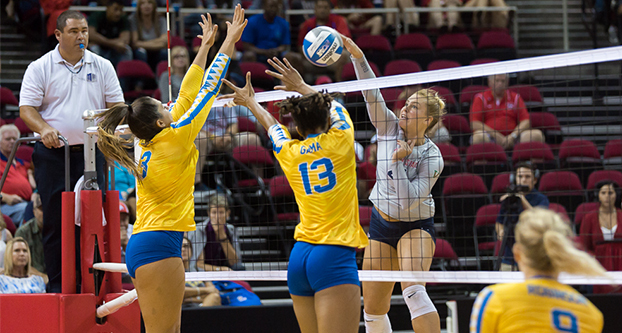 The Fresno State’s women’s volleyball team continues to fall short, losing Saturday 3-1 at home to San Jose State. The Bulldogs started out the first set with aggression, creating great chances off the serve and jumped out to a 7-3 lead. They didn’t take their foot off the gas, winning the set by a score of 25-17 with an attacking percentage of .450. The team’s strength in the first set turned into its weakness in the second, according to head coach Lauren Netherby-Sewell. “Unfortunately, our serving got a little weak in the second set and that gave them a little bit of confidence so they started running the double quicks,” she said. The Spartans took a 23-15 advantage. The Bulldogs fought back but were unable to complete a comeback. They lost the set 25-18. “Once they got on a roll, we just couldn’t stop it, and they got a lot of confidence doing it. We just gave them a little too much momentum,” Netherby-Sewell said. In the third set, the Bulldogs were able to beat the Spartans 7-5 in aces but still lost the set, 25-21. Fresno State couldn’t stop the momentum that it had allowed San Jose State to gain and lost the fourth set 25-22, the closest score of all four sets played. Freshman Sydney Lostumo, who ended the match with three points on 19 assists, three aces and five digs, attributed her performance in part to her being more comfortable with her increase in playing time recently. Junior outside hitter Taylor Slover had the second-most kills in her career with 21 and ended up with 21 total points. She still thought she could have done better for her team. 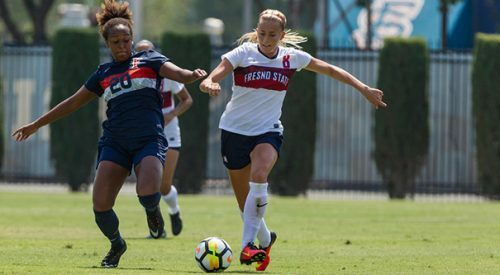 Fresno State has now lost seven of its last nine matches, dropping the Bulldogs’ record to 5-10. They are 10th in the 11-team Mountain West Conference. Netherby-Sewell remains hopeful as she notices improvements in the team’s play despite the recent tough stretch. “We have to just keep chipping away. We have gotten better over this last week. We are playing better volleyball. Our offense and serving got better, and that is what we’ll keep doing,” Netherby-Sewell said.